Sawtooth Ski Trails Not Yet Groomed… Stay Tuned. by DK | Nov 18, 2017 | . 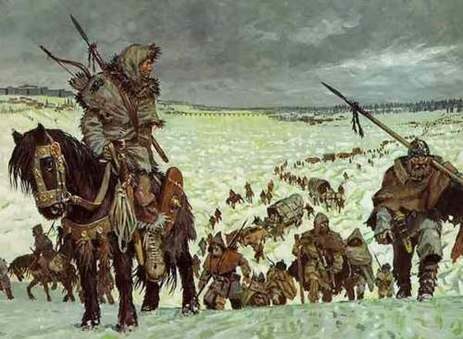 On the 18th of November, in the year 401 AD, those wild and crazy guys, the Visigoths, crossed the alps looking for good skiing and a civilization they could sack. Now, exactly 1,616 years later to the day, we once again must contemplate not only the approach of ski season but also civilization apparently on the skids. Do not despair! Although cross country ski trails at Alturas Lake and Park Creek have not yet been groomed, you do not have long to wait. Our wild and crazy groomer guys have shoe gooed their snow boots, their snowmobiles have been serviced, their ginzu knives have been sharpened and they are almost ready to go. With a bit more snow to cover the sagebrush and a renewed determination to groom the best darn ski trails known to man, this year the Sawtooth Valley cross country ski trails are no doubt primed to set civilization and its discontents on a new course, kicking and gliding over soft white corduroy into the aquarian age.